The Ohtawara Marathon Project | This is my project to run a 3 hours 10 minute marathon on 23rd November (2013) (2014) (2015) (2016) (2017) (2018) 2019 in Ohtawara, Tochigi Ken, Japan. With Gary, Rachel and Bob before our race and after Gary’s. Does it look like we are trying to keep our distance? I signed up for the Half Marathon on a whim about 4 weeks before it was due to take place. I had recently finished the Koga Marathon and thought that my season was all but over with the exception of the Fuji Susono Half Marathon in May, which is kind of a drinking weekend away. Seriously! But then one lunchtime (I swear that it was lunchtime) in March I noticed Bob Poulson, Gary Wilberforce and Nizar chatting about this race and I threw my hat in the ring. Fast forward 4 weeks and after almost no training, I found myself on the 9:02 from Mizonokuchi on the way out to the Arakawa River in East Tokyo on a day that was going to be hot and sunny. Not two of my favourite things when I am running. I met Bob at Nishi Nippori Station and we headed over together to the start. Bob, Rachel and I were running the Half and Gary was running the 10km. We arrived just at the start of the 10km at 10:35 and shouted encouragement to Gary as he headed off. He didn’t need it as he ran well and finished 3rd. The half started at 11:30 as the temperature was beginning to rise. There is nowhere to high along the Arakawa river as there are no threes and when the sun shines, you just have to put up with it. Fortunately, I had covered myself in sunscreen before the start. I knew that it was going to be a long day and if I was going to hit my target of breaking 1:40 I would need a conservative approach and not burn up too much energy at the start. I quickly got into a 4:40/km pace and managed to keep it below 4:50 for 3/4 of the race. There were 6 turn arounds and I saw Bob at each one. I calculated the time that he was behind me at each time to see if he was gaining. His plan was to run at a 5min/km and then kick at the last 6km if his hamstring felt good. I know that he has a good kick and I needed to get some time between us is I was to stay in front of him by the end of the race. He had found himself in behind the 5-minute pacer and had a wry smile on his face every time we passed each other. The course consisted of three 7km loops. This was fortunate. I don’t think that I could have coped with four loops. Psychologically the more loops the harder. I kept my pace at 4:50/km or lower until the 16km when it crept up to 4:56/km. I was struggling in the heat but I knew that I could finish and kept my head down and drank at every chance I got. I had run a Park Run (5km) in Futakotama on the day before, and it was very tough. After 1km I swore to myself that I would give up on the Half on Sunday, so to be 5km from the finish and still running was a bonus. After the last turn around the gap between Bob and myself had grown from 2:42 to about 4 minutes. There was just over 1km to go so I knew that I could hold him off. Later I learnt that he was also suffering in the heat and his legs were getting sore during the last 5km. I was very pleased to complete this Half Marathon. Although the time is not great, it was great to get back in the game after Koga and I plan to get in a few more training runs before Fuji Susono. Running a marathon the day after your birthday is not always great, but somethings we have no choice. I had a wonderful birthday on Saturday and went to bed early for my race on Sunday. Unfortunately, I woke up at 2:30am and then failed to get back to sleep. I finally got up at 4:55am and was not surprised to see that my HRV and RHR were the worst that they had been in a long while. As I had a race that morning, there was nothing I could do but get up and get out the door. This was the 3rd time that I had run the Koga Hanamomo marathon. It is a little outside of Tokyo but as the race was at 10am, there was plenty of time to get there and hang out for an hour before the race. We arrived on the train at 7:39 and after a short walk, took the free bus to the start of the race, arriving around 8:30. We then collected our T-Shirts and by 8:50 we were sitting in the bleachers of the local stadium waiting for the start. And then the sun came out. I always bring sunscreen with me as I am very fair skinned but I was not expecting so much sun. Sitting in the stand it was positively hot and I was afraid that I would get burned. Heading to the start from the station with the Namban Rengo crew. At 9:35 we headed off to the start of the race and after a quick stop at the restroom, I was in my block by 9:50. At Koga, everything is nice and relaxed and there is a very friendly atmosphere. The race seems to have grown in numbers in recent years with 10,500 people entered in the marathon, 10km and family races. Unfortunately, the size of the roads have not changed and it quite difficult to start. I had hoped to run at a 5 minute/km pace but because, the streets were so packed my first 1km took 5:25. After that, I got into my groove but I was not feeling great. My glutes and inner thighs were feeling sore from the start for some reason. I was not sure why as, I had not done anything strenuous in the last 8 days. A final photo before we headed to the start. The course is very flat and I managed to keep close enough to my 5 min/km goal, going through halfway in 1:48:37. I knew at that stage that I would not make sub 3:30 but thought that I still had a chance to get in under 3:40. However, shortly after halfway, my pace dropped to 5:15 /km and then to 3:30/km after 30km. At 32km I took my first walk break and then again at 35km. The wheels had really come off. I was walking for a minute and running for a kilometre, all the time hoping that the pain would end. Finally, I saw Jay and Arnaud on the side of the road with 1km to go, cheering me on. I was about ready to give up when I saw them but since they had waited around after the 10km race I could not. I pushed on into the stadium and completed the 3/4 circuit to finish my 21st marathon. Thanks to Arnaud for taking this photo in the last kilometre of the race. I am in a lot more pain than I look. While I was glad to finish the Marathon, my overall feeling was one of a missed opportunity. I thought that I had trained sufficiently well in January and February to get back to where I was 3 years ago and run a sub 3:30 marathon here. It was not to be the case and I will have to go back to the drawing board again before I attempt the races next winter. Things improved a bit this week. Even though my HRV continued to decline, I did start to exercise again with 2 Bikram Yoga classes and 3 runs. What’s more, is that I got to watch the Tokyo Marathon go by at the 5km point. It is really fantastic to see the lead runners go through in 15 minutes, but it is also awe-inspiring to see the people who go by 1 hour later, some of who are walking and eating even though the race has just started. Everybody has their own story to tell. Everybody is focused on finishing, whatever it takes. I can learn something from all of them. If you would like to see my photos, please click here. A slight improvement in my HRV but I decided to start the week at Bikram Yoga rather than running. I think that I made the right decision as I had not been for over 2 weeks and I was woeful. I still enjoyed it immensely. Daughter #2 was also travelling from Hamburg to Cork via Dublin by herself so I was a little worried about it. Especially as she had only left herself 1 hour to get off the flight, collect her bag and get the bus to Cork. I found myself awake from 2:30 to 3:30 texting her to make sure that everything was going OK and she had not been kidnapped or arrested. Fortunately, it all worked out. I went out for a few beers on Tuesday right after work but we finished early and I was home before 8pm. I still had lots of time so quickly changed and headed out for my first run since the Ome 30km race. I was fairly relaxed and managed to up the pace fairly quickly and somehow managed to run the 12.4km in 58 minutes. I was really pleased although I was very sore at the end. Wednesday I was sore in the morning after Tuesday’s effort and my HRV was down. I was not going to run in the morning and I had a conference call in the evening so I was not going to run then as well. I made peace with the fact that I am no longer running every day and got on with my business. Thursday and my HRV had started to return to normal again. I can’t remember why I did not run on Thursday night but I think that I had more calls until 7pm and I was fairly tired by the time that I got home. Another modest improvement in my HRV as I continue on the road to recovery. Again, I choose Bikram Yoga over running as I felt that I needed more practice. It was a better session that Monday and afterwards Bob, Naoko and myself headed to Devil Craft in Hamamatsucho for a few beers and a veggie pizza to celebrate the start of March. Somehow my HRV stayed in a good place on Saturday morning despite the beers and the pizza. We had some beds arriving for daughters #1 and #2 so I could not run first thing in the morning. However, everything was in place by 11am and I hit the road just before noon. My plan for Koga is to run under 3:30 which means run at a 5 min / km pace. I thought that I would go out and try that pace out over a 20km course, up and down the Tamagawa River. It was warm and sunny and I was able to go out in just a T-Shirt. I quickly found myself running at 5 min pace and then faster. I initially tried to slow myself down, but after a while I gave into it and just ran to my heart’s content. After a while I was running at 4:45 / km and it did not feel too bad. The challenge will be to not run at that pace next week as I know that I will crash and burn like I did in Ome and crawl home for the last 12km. Sunday morning and my HRV had dived 17 points. I am not sure if it was the hard 20km that I had run the day before, or the bottle of wine that I had drank with dinner. OK, it was probably the wine. Sunday was the day of the Tokyo Marathon and many members of my club, Nambam Rengo, were running and I was going out to support them. So, after resetting my alarm twice, I dragged myself out of bed at 6:30 and headed off to Iidabashi to cheer them on as they came through the 5km point. I have run the Tokyo Marathon before and always appreciated the support so I wanted to shout encouragement at my friends in return. It was a wet and cold day but I really enjoyed standing on the side of the road cheering people that I knew and those that I did not. 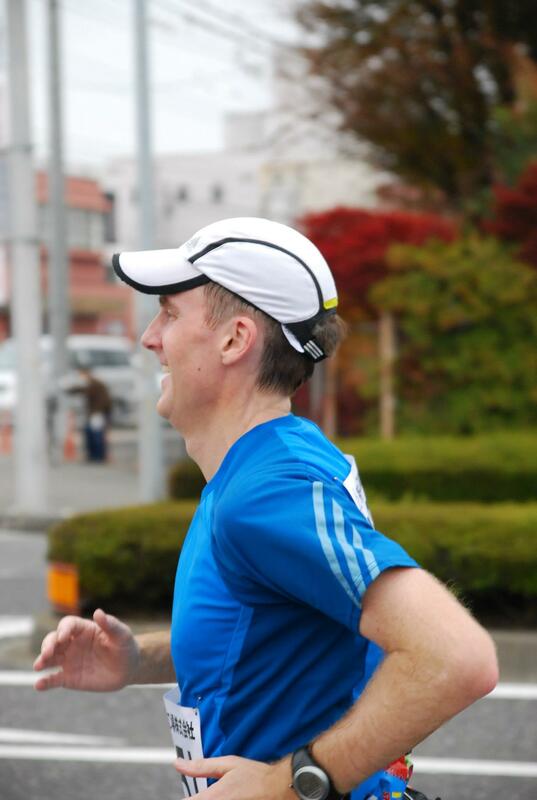 Tokyo Marathon is a fantastic event and one in which everybody the city can get involved. I left Iidabashi after an hour to meet Mrs. M in Shibuya to look for her dress for the Emerald Ball which will be held on 16th March, conveniently 6 days after my marathon. We went to half a dozen shops and had some success before heading home. As soon as I got home I downloaded the photos from the marathon and headed out the door to complete my week’s running. It was still raining and cold but I dressed well and qucikly dispatched a 10km run in 53 minutes. I don’t know how I will get on next Sunday, but I am in a good place as regards my running and hope to go out and enjoy it, like all those folks in the rain today. Last week was terrible. I ran hard at the Ome 30km but was ruined afterwards. I ran hard in the race and then I didn’t run again for 8 days. I was tired the whole time. My HRV was down and my Resting Heart Rate was up. I took it as easy as I could all week and hope that I would get back to fitness before the marathon. This was a great week for running but a hard one. It started in Nagano and finished in Ome and I am truly wrecked. I have started to rethink this running everyday plan and will get more rest before my marathon on 10th March. The Ome 30km race on Sunday was very tough but I had had signals all week that I needed to rest and I did not take them. I have 3 weeks now to put things in order and I will continue to use HRV to monitor my progress. Monday morning was a National Holiday in Japan and we were still in Nagano. I woke early and got out on the road before the others were awake. The plan was to run down to the Chikuma River which runs through Ueda, run along it for a few kilometres before hanging a right and start running uphill past the Shinshu International Music Village and the 3 ponds before cresting the hill and running back into Ueda and home. It is a run that I discovered 2 years back when I was looking for somewhere other than the Shimin No Mori run which I did on Saturday. I love that run, but it is long and hard and sometimes I need something a little different. It was nice and cold when I left the house and there were not many people about. Just a few folks heading up to Sugadaira to go skiing. The run along the river was pleasant but it got really good once I turned off and started climbing. It was quiet and still and there were snow and ice on the road and the ponds. Going up was not as hard as I expected but the hill went on longer than I remembered and I was covered in sweat by the time I reach the top. The downhill is great fun as it is far steeper than the uphill, reaching 10% in places. Every time I am running down it, hoping not to trip or slip on ices, I always tell myself that I should run up this way next time. The only problem is that it is a little difficult finding the point of entry and I am not sure that I can remember it. It was a wonderful final run in Nagano, rounding off the long weekend with 3 runs and a ski trip. You can hope for more than that. I woke up early enough on Tuesday morning to get my run in before heading to work. I had not taken my HRV and RHR while I was in Nagano and I was happy to see that it was still in a good place. Unfortunately, it was not to stay there for long. I didn’t take the HRV and RHR in Nagano because it was too darn cold. As soon as I woke up, I got up and could not hang around the futon for one minute. When it is -6 degrees C you need to keep moving until the heater starts up. Wednesday morning was the first sign that things were not going great. My HRV dropped 12 points for no apparent reason and I was feeling very sluggish. Fortunately, I did not have to run in the morning as Wednesday night is Namban night. I met Bob J at the sento before we headed off for 10km running in Yoyogi Park including some of Mike Trees’ bounding exercises. I was not feeling great and took it very easy. I then headed over to the track to meet Jeffrey from our Get The Run Done running streak group. We are all trying to run at least a mile each day and Jeffrey has been a member since last year but I never had the pleasure of meeting him until Wednesday. After we greeted each other, Jeffrey went on to do the Namban intervals and I headed back to Yoyogi Park for a few more easy laps. Thursday was, of course, St. Valentines Day and in time-honoured Japanese tradition, Mrs. Mac Colgain presented me with a box of delicious chocolates first thing in the morning. I didn’t have any before my run. If I had I might have blamed my poor performance on them, but of course not directly to Mrs. M. Although my HRV had improved a bit on the day before, I was still not feeling great. I still was not feeling great as I plodded around my neighbourhood on Friday morning. I had no intention to do anything but the minimum with the race in 2 days. Saturday morning saw a slight improvement in my HRV but the overall trend was still going down. I went out for the minimum again and spent the rest of the day indoors before having a race meal of vegetables and potatoes. I woke on Sunday morning to a further drop in my HRV and Simon telling me to take a break. Had it been any other day I would have stayed in bed and recovered. I was particularly disappointed because I had taken it so easy on Saturday. I just ran a slow 5km in the morning and hardly left the house for the rest of the day before going to bed before 10pm. This morning I had the Ome 30km Race so instead of staying in bed, I was on the platform of Musashi Mizonokuchi station waiting for the special train to Kabe that Hayakawa san had booked for me. Normally I have to change trains in Tachikawa, but there was a race express on this morning which went right to the start. Hayakawa san lives up the line from me and got on the train at Noborito. On the special Kabe Express with Hayakawa san. Kabe station is tiny and was packed so we headed straight to the Race Reception to collect our T-Shirts and bibs before heading over to the place the Terry from Namban had picked out for us to set up camp in a park across the road from the hospital. It was a great location and Terry had driven up in the dark hours to make sure that we got it. Walking to the start line. Photo was taken by Seung Gi. I was number 4408 in a crowd of 12,000 men and 3,000 women runners. The starting blocks were very strictly marshalled and I started in Block E. I could bearly see the sign above the start line from where I was and it took me almost 3 minutes of walking to get to it once the starter’s gun went. I assume that it was a gun as I could not hear a thing other than Sydney Olympics Marathon Gold Medalists, Naoko Takahashi, shouting “Gambare” to everyone. The troubles did not end with getting to the start. The road was narrow and packed with runners. I spent the first 3km trying to find my stride and my pace. Eventually, things started to go OK and I tried to build up to my target pace of 4:40/km. I never really got there but I was around 4:50/km pace at the turn around point and I thought that I might have a chance to gain back some more seconds on the way back as it was downhill. The course is one I know well as I have run many training runs out there with my Namban teammates and I enjoyed running down the middle of the street instead of upon the narrow footpath. It was a glorious day and the sun was out in all its splendour. I felt I was running well up to the turn around point at 14.5km and was sure I could start to make up time. On the way out. Photo taken by Brett. As you can see above, my pace held up OK to the 20km where I was still running at 4:50/km pace. At 21km there is a hill and here Naoko Takahashi appeared again giving high fives to everybody in the middle to the road. She appears in nearly every race I run these days. I put my head down and powered up the hill as best I could without losing too much time and telling myself that I only had 9km left. Unfortunately, my legs did not know it. Although we were running downhill, for the most part, my pace started dropping to an average of 5:15/km. With 7km to go, Hayakawa san came flying past me. A little later Mika san also passed me. Within the last 3km, Mark Feeley went by. All of them looking great. I tried to react to each of them but I had nothing left. I kept wondering if I should stop and walk for a bit as my left leg was sore but I managed to convince myself to continue to the next KM marker each time. With 2km to go, I looked at my watched and saw 2:19:30 and realised that if I put my head down and pushed it, I could get in just under 2:30:00. I put everything I had in it and just managed to get across the line in time. 1km to go! Photo was taken by Bob P.
I could barely move. I walked gingerly round to collect my medal, a bottle of Sports Drink and an Ume Onigiri before heading back to the park for some pizza that Seung Gi had generously ordered for us. Hayakawa san and Mika san were walking ahead of me and I still could not keep up with them. I got a protein drink from a Savaas lady and some Amazake from a local lady who had set up a stall outside her house. All along the course, local people were handing out food and drinks. I think that it was one of the best-supported races that I ever entered and I look forward to coming back next year. Another good week running. Even though my total distance was less than the last 2 weeks, I thoroughly enjoyed myself and got in some tough runs and some skiing too. Also, it was the week when two of my children had their birthdays and my father would have turned 85 had he lived. Quite a lot to take in but it all worked out well. Monday was the birthday of daughter #1. I got up and out the door early as we were going out to dinner that night and I ran my 5.3 route through Mizonokuchi. I was very sore after Sunday’s relay race but it was a good pain. The type where you know that you have done a hard day’s work. On Tuesday my Resting Heart Rate and Heart Rate Variability were back to normal and so was my pace as I ran through the neigbourhood again as soon as I got up. Wednesday I was back at the track with Namban Rengo running intervals at Oda Field track. It was over 2 months since I had done intervals and I was happy with the result getting each of the six 1kms under 4 minutes. Thursday I was back running around the neighbourhood although I was a little sore from Wednesday night’s effort. Friday I got up early and ran a little more than usual for a Friday morning. We were headed that night to Nagano for the long weekend and I wanted to get the weekend off to the right start. Friday was my son’s birthday and we all woke up in Nagano. I woke before everyone and got out the door to do my long hilly run, 30km with a total elevation gain of 715m. I ran up to Shimin No Mori in Ueda and straight down again. It was a tough run where the downhills hurt as much as the uphills. I am hoping that it will have a positive effect on next week’s Ome 30km race. Sunday I was planning on going skiing so I needed to get up at 6am and get my run done before I headed out. I guess I could have done it when I came back but I did not know what condition I would be in. It was snowing and cold when I left at 6:30 but I had a nice run-up to the Joshinetsu motorway and back. I guess that I waited too long before leaving and by the time I got to Sugadaira all the parking spaces that I usually go to were taken and I had to head up to Davos. Yes, that is the name of the place in Nagano. Anyway, I soon got a place there and had a good 4 hours of skiing before heading down the mountain in daylight. I also met Tony from Namban Rengo in the restaurant having lunch proving that it really is a small world. I had so much fun running last week that I had no time to write my blog so I am going to try and rush through it on Tuesday night so that I can get it out by the weekend. In summary, I ran a lot, had great fun, met loads of friends, my HRV increased, my RHR decreased, I increased my running streak to 30 days and I can’t wait to do it all again. Back running in the morning. It felt good to be out of bed and running at 6am with the whole day ahead of me. I even made my 5th yoga lesson of the month on Monday evening. A much faster morning than I have been used to. Felt good to be legging it around the neighbourhood. Wednesday I was back at the track in Oda Field for the first time this year. As it was the last day of the month, we had the 5km time trial. I ran 20:30 which was more than 30 seconds faster than the last time I ran that 5km at the end of November. I was slow and tired on Thursday morning after the efforts at the track the night before. I managed to get up and drag myself around the neighbourhood for 30 minutes and I was happy with that. I had a bit more time than usual on Friday morning and I headed out the door and did a 20km easy run. It was a beautiful morning and I loved the views of Mt. Fuji. On Saturday I headed back out to Ome to run the course in preparation of the race that I will participate in on 17th Feb. I was with the Namban crew and had a great time, running faster than the previous Sunday. I finished the 30km in 2:25:43 leaving a sub 2:20 still a possibility in 2 weeks. Sunday was a special treat as I join the Iikoto Challenge with 21 other Nambanners. This is an Ekiden that takes place in and around Nissan Stadium. The race lasts 5 hours and each lap is 1.623km. There was 7 in my team and we swapped every lap. I was very pleased that I go all the laps done in a consistent time and even managed to speed up for the last one. I was a bit worried going into this event that it would not be sufficient training for a marathon, but it was very tough and I really felt my legs by the end.